More Important: Technology or Audience? I’m working on an augmented reality solution for a medical client of ours and I’m once again struck by an interesting dichotomy, one that I find recurring in every “emerging” solution I’ve launched: the balance between pushing technology and utilizing its strengths vs. creating a solution appropriate for the audience. One school of thought is to push the limits of the technology. Since it’s new and often times experimental, we should try to use it for what it’s worth. If it’s touch screens, push for it to be multi-touch, allow the user to “throw” items, work in video hosts and multiple pathways – all make for rich experiences and play to the strengths of that particular technology. If it’s mobile integration, customize everything, send coupons/messages, utilize the Bluetooth and/or GPS. If it’s augmented reality, play as much as you can with the real world object and use it to base as many interactions between the two worlds as you can. In all cases, we’ve got this technology, it has so many possibilities, push them to show how strong they are. But then you have the other school of thought – how is the audience really going to interact with them? I understand that we can’t underestimate the audience. When I was in college, in screenwriting classes, I heard over and over again – “don’t underestimate your audience. They’re smart.” Same thing applies here, especially since this sort of marketing is more experiential. But we can’t overestimate them either. From my point of view, and most people around me, we know how these technologies work and we’re anxious to play with them. We’re in the minority. Most people, particularly over a certain age, don’t feel completely comfortable in front of their computer and don’t fully understand the capability of that device. Same thing with mobile phones. Forget about something that they’re required to go up and touch, especially if it doesn’t look touchable. Or something that they’re required to hold up to a webcam. I’ve seen over and over again that in most cases, you have to keep it simple, which is counter to really utilizing these emerging technologies to their full extent. And this is so indicative to where we are in the industry right now. This sort of marketing and experience – IOOH – is intimidating. I think people see the hassle or the “weirdness” of it all instead of seeing its potential – a new way of learning and communicating. We can create experiences through these types of technologies that can make people’s experiences outside of their home much better, much more seamless, much more effective. By and large, they just don’t know it yet. So, I’d just say, it’s always important to think about the capabilities of these technologies. Always know what they can do, but create solutions – regardless of how “much” it utilizes the true power of the technology – that are most appropriate to your audience. 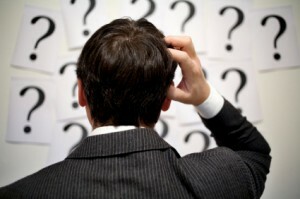 The basic fundamentals of marketing still apply – know who you’re talking to before you come up with a solution. To be most effective in this new field, keeping it simple will pay more dividends and help out in the long run, more than whiz-banging people right off the bat with this newfangled technology. We can be just as capable of creating innovative solutions. Thoughts? Let me hear them. This entry was posted in Marketing and tagged Augmented Reality, Bluetooth, emerging technology, GPS, IOOH, Mobile, touch screen on 04/08/2010 by Mike Cearley. A couple of days ago, I shared my vision of OOH. It’s pretty simple. 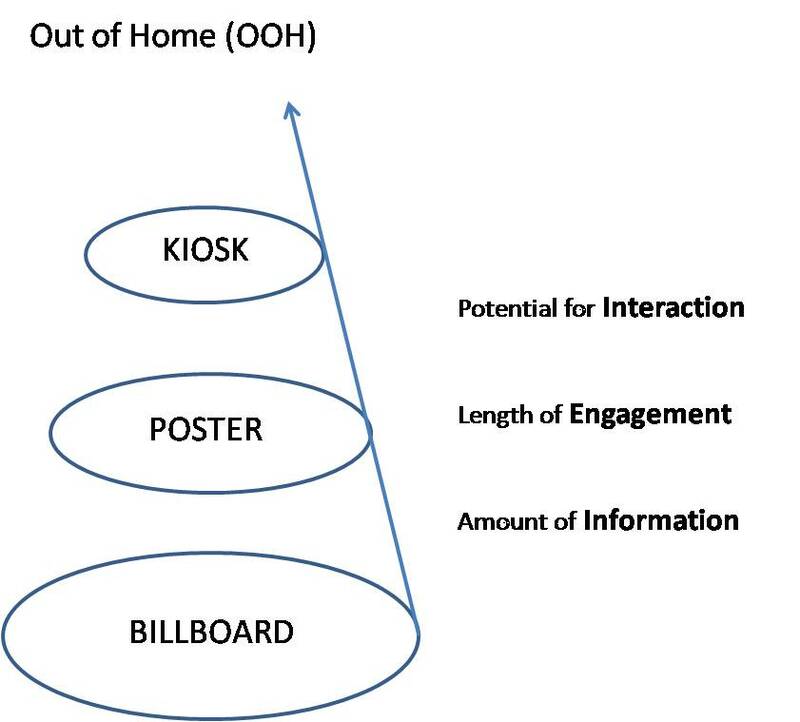 In my view, OOH is broken down into 3 buckets – categories of displays if you will – billboards, posters & kiosks. 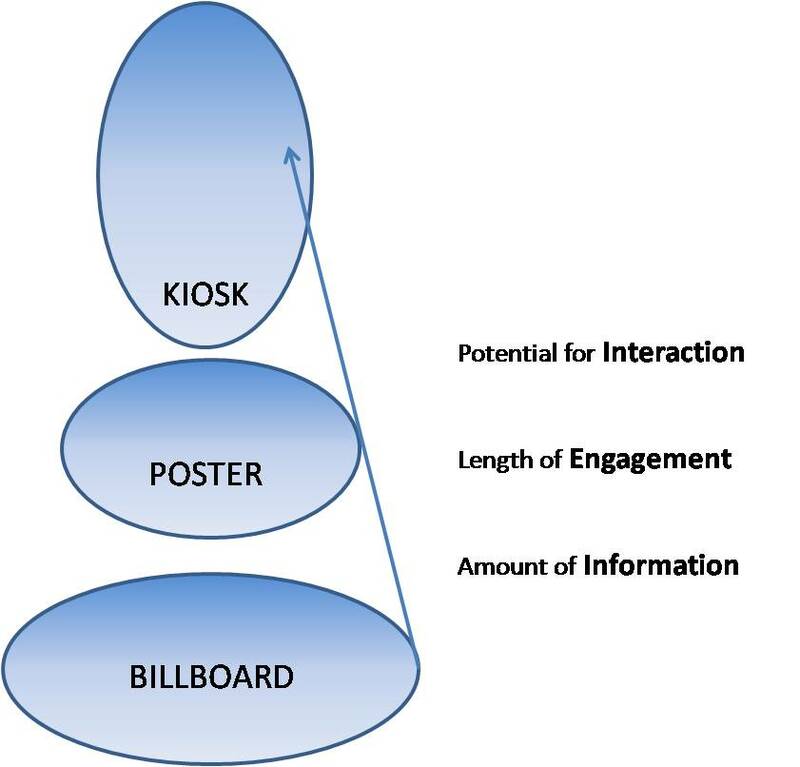 They are separated by 3 differentiating factors – amount of information, length of engagement and potential for human interaction. When you add digital to this model, you get the same exact model with just a little different shading. It doesn’t change much other than the fact that there is now some sort of technology applied to the medium. In this case, “digital” is just the addition of display technology. As I’ve said before, display technologies are a finite list of technologies – LCD, LED, projection. All it does is enable a static display to become dynamic. For advertisers, this, of course, has a substantial impact, both with advertising-based displays/networks and non-advertising-based displays/networks. But the true effect on the consumer’s experience isn’t drastically different. When you apply a display technology to a billboard, you get a different type of billboard, but by and large, it has the same effect. Ditto for posters and kiosks. As a consumer, I’m still getting the same amount of information, I’m still engaging with it the same length of time and the potential for my interaction with it hasn’t changed. The primary difference is that it now moves. Is it more effective? Maybe. If I respond better to moving images rather than static display. If the content is compelling. But I don’t think it moves the needle by itself. 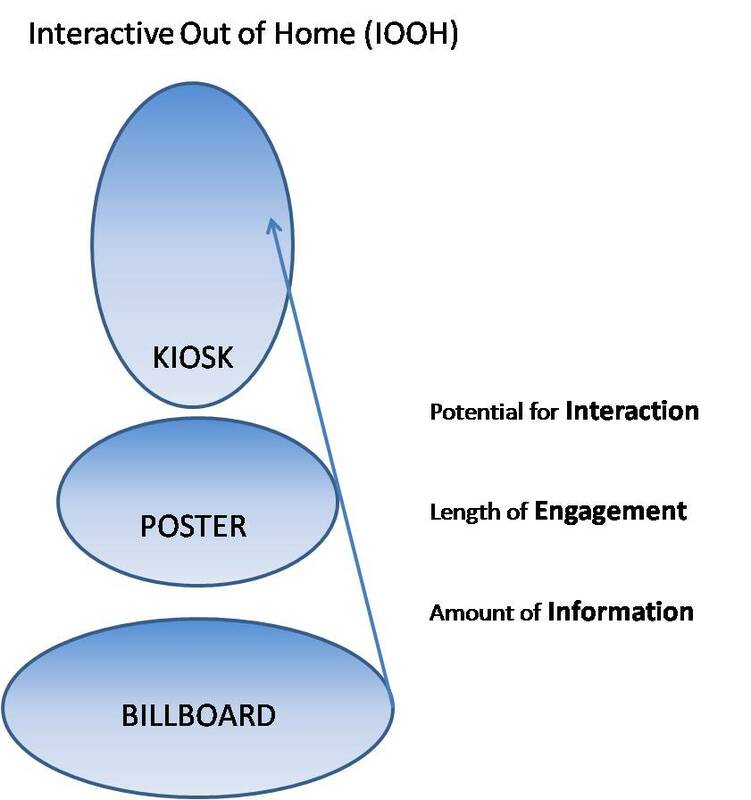 The true magic happens when you make OOH & DOOH interactive, which I’m calling Interactive Out of Home (IOOH). This sort of engagement opens up an exciting and scary world of possibilities. Brands will sooner or later understand that they can (and should) use the spaces and things around us, in our everyday lives, as effective communication tools. It has a drastic impact on them and their ability to touch their audience anywhere they want/need. We’re a ways off though, as you’ve heard me say before. But make no mistake, technology – specifically enabling technologies (not display technologies) – transforms the OOH world into something that has only truly been applied in books and movies. For now, we keep pushing and experimenting. This entry was posted in Marketing and tagged Bluetooth, DOOH, enabling technology, GPS, Interactive Out of Home, IOOH, Mobile, OOH, Out of Home, QR Codes, RFID on 04/01/2010 by Mike Cearley. 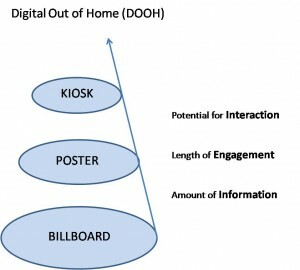 In my opinion, the term “Digital” Out of Home, or “DOOH” is becoming widely overused. So much so that I think it dilutes the space, minimizes the impact of what can truly be done through technology outside of the home, and ultimately, confuses people – advertisers, marketers and brands alike. I look at the term through a simple lense. Digital Out of Home (DOOH), to me, is nothing more than adding display technology to an otherwise static OOH installation. So, let’s take a billboard for instance. 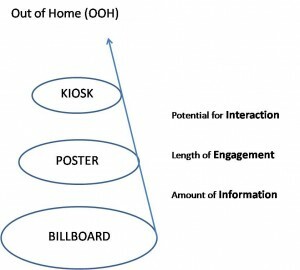 The standard OOH installation is a static billboard. 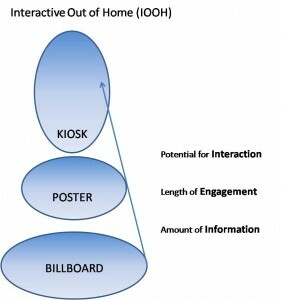 The digital OOH installation is created by simply adding some sort of display technology onto the the static billboard. This can be through LEDs (as is the case with billboards), LCDs, plasmas, or projection. 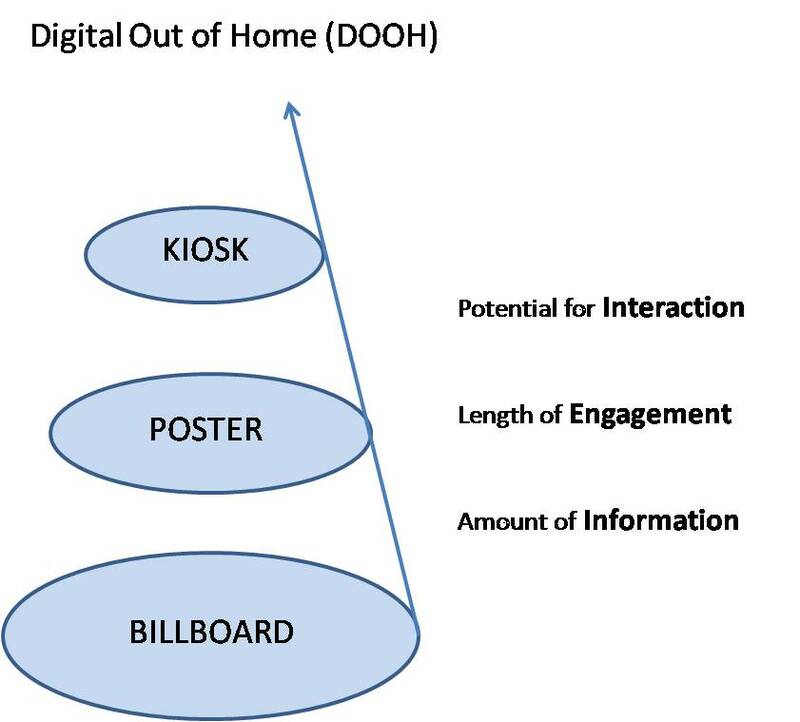 It’s a finite list, but apply any of them to any static OOH installation and voila, you now have a digital version of said installation – Digital Out of Home. I think it’s important to make this distinction, especially with the introduction of other technologies that make our surroundings, including these billboards, come to life. As mentioned in a previous post, I call these sorts of technologies enabling technology. Right now, I think it, too, is a finite list, but it’s a bigger list than display technology. RFID, for example, is an enabling technology. GPS is an enabling technology. Mobile, albeit more broad, is also an enabling technology. But within mobile, I think you start to see a subset of enabling technologies like Augmented Reality, QR Codes, MS Tags, and Bluetooth. Then, you have touch screen technology (single and multi-touch, even gesture-based) that is on the list, too. The point is – these technologies enable personal interactions with an otherwise digital installation. At this level, it is not Digital Out of Home to me. I sense more and more that the industry and many of the players in it call everything Digital Out of Home just because it occurs outside of the home through any sort of technology. But unless we start talking about it in consistent terms, how can we expect it to catch on and even grow? Do you agree? I’d love to hear your thoughts. This entry was posted in Emerging Technology and tagged Augmented Reality, Bluetooth, DOOH, enabling technology, GPS, Mobile, MS Tags, QR Codes, RFID on 01/22/2010 by Mike Cearley.